The date was Feb. 6 2009. We were at my doctor's office for my 12 week prenatal appointment. I was looking forward to a quick check-up and then calling/texting/emailing everyone with the good news that we were expecting. But my OB could not find your heartbeat on the doppler. My heart sank, then it began racing along with the nervous thoughts in my mind. My very compassionate doctor calmly told me not to worry, that we'd just go down the hall to the more powerful ultrasound machine. I bit my lip, held back the tears, silently prayed that you were okay. In less than a minute you pooped up on screen, wiggled, and gave us a wave. The OB turned on the sound and there was your heartbeat...loud and clear, fast and strong. I let the tears flow then. I was so relieved and grateful. That was the day we crowned you queen of our hearts. So sweet! 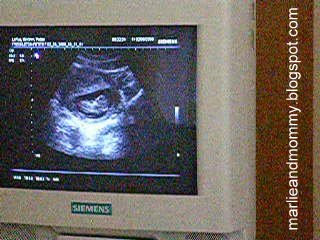 I had a scare early on and was so relieved to come in for an ultrasound at 9 weeks and hear his heart beating. When I think back to ultrasound times and preggo times, it seems so amazing to me that he is here now and a real little boy. I wonder when that feeling goes away? And when she is about 12, she will become queen of your wallets. And when she is 16, she will become queen of your cars and bank account. Awww what an experience. I remember the moments before they discovered the heartbeat, it was like all the oxygen was sucked out of the room for that time. You heart almost stops beating it feels like. I know how it feels! Oh, I know that this is one of those sentimental moments you'll be able to share 4ever and definitely won't forget! Marlie is such a beautiful blessing, I'm loving your wordless wednesday picture. She's growing so nicely and you always manage to capture her looking right into the camera. She's a natural model! awww amazing! I remember those dys I still hv my ultrasounds. Wow, I can imagine the rollercoaster of emotions on that day! That must have been scary! Sometimes we had trouble getting V's because she was positioned weird, but we were always able to get it with his handheld device. Of course, back in the dark ages, when I had J, they didn't use anything but a stethoscope.